ePublishing Knowledge BaseePublishing Knowledge BaseePublishing Knowledge Base Creating Image Galleries, Videos, Podcasts, and Downloadable FilesHow do I find remote files I added from YouTube, corporate digital asset management servers and other locations? To find files you have added from remote locations, including YouTube and corporate digital asset management servers, conduct a file search in your Media Manager. Follow the directions in this article to return only search results that are hosted remotely. 1. 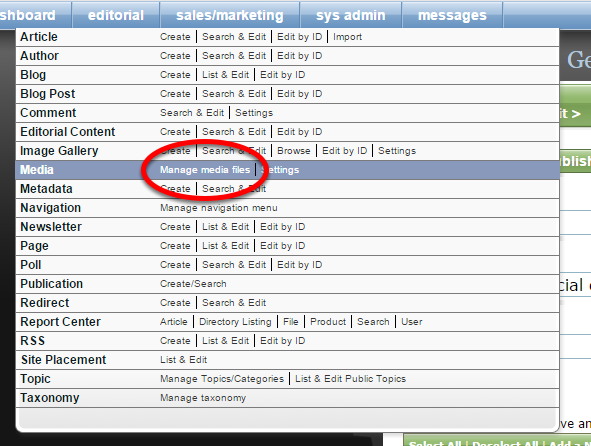 Open the Media Manager under Editorial on your Dashboard. 2. Click File Search in the top-right. 3. Select "Search ONLY remote files?" And then conduct a file search just as you would any other file type. Prev: How do I access the Media Manager? Next: How do I add videos from YouTube or files from corporate servers to be easily used on my website?